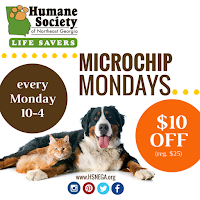 Humane Society of Northeast Georgia offers Microchip Mondays! 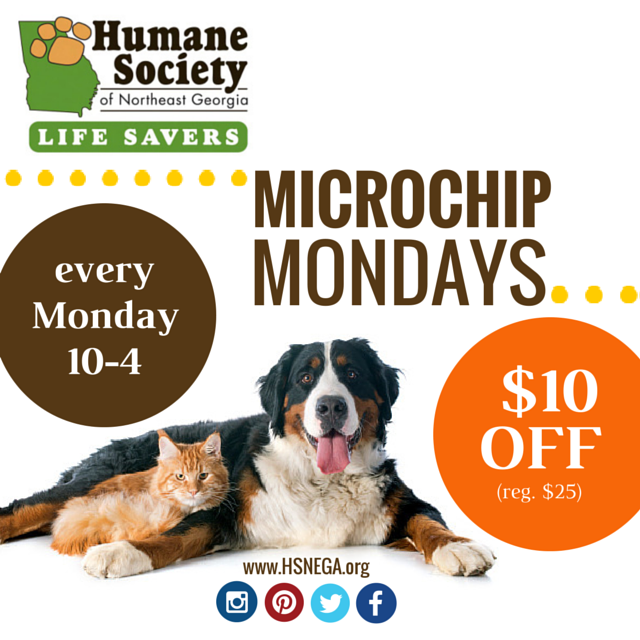 On Mondays only, pet owners will receive $10 OFF microchips in our Wellness Clinic. (reg. $25 for a U.S. chip, $30 for an International chip). The total price with the Monday discount is $15 for US chip, $20 for international chip. According to The American Humane Association, more than 10 million dogs and cats are lost or stolen in the U.S. every year. One in three pets will become lost at some point during their life. Having a ‪microchip‬ tremendously increases the likelihood of finding your ‪lost pet. Microchips are available at Mon-Fri, 10-4, no appointment needed. HSNEGA is located at 845 West Ridge Road, Gainesville, GA 30501. Check their website or call 770-532-6617 for more information.